Putting the planet on stage during Earth Day. 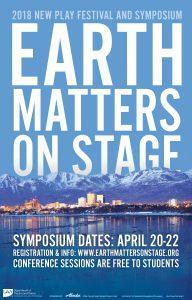 During the Earth Day weekend, artists, performers, thinkers and students from around the world will amass at the Earth Matters on Stage symposium at the University of Alaska Anchorage. The purpose? To put the planet center stage. “I’m very big on using theatre as a vehicle to talk about large questions and issues, and so I’m always looking for shows and opportunities to do that,” said Brian Cook, assistant professor and chair of the UAA Department of Theatre and Dance, the host of this year’s EMOS symposium from April 20 to 22. On opening day of the event, Trustees and other local groups will join a session addressing Alaska’s environmental justice and climate issues from 1:30 to 2:50 pm Friday, April 20. Other presenters and participants from around the world will tackle subjects like how land use affects movement, how to engage people in the climate lens, and how to use the arts to deepen human connections to nature and environmental stewardship. The three-day event includes presentations, panels, movement and writing workshops, and readings and performances from the EMOS New Play Competition. Anyone can join the symposium for as little as $10 a day, free for high school and college students. The triennial EMOS event calls forth and fosters new dramatic works that respond to the ecological crisis. The first EMOS took place at Humboldt State University in 2004, and then traveled to the University of Oregon in Eugene, Carnegie Mellon University in Pittsburgh, and the University of Nevada, Reno. Playwright Crystal Skillman’s script will be produced by the UAA Department of Theatre and Dance. EMOS arrives in Alaska at a time of great peril to public lands, waterways, and traditional ways of life from the Arctic to Southeast. Putting the planet on stage during Earth Day puts attention on what’s happening in the arts and environment in Alaska. 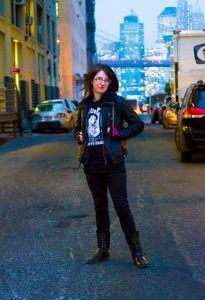 Each day of EMOS culminates with a production of this year’s winning script, “Rain and Zoe Save the World,” by New York playwright Crystal Skillman. The play trails two Seattle teenagers as they embark on an impulsive motorcycle trip to an East Coast protest of oil development while following a pipeline along the way. Tickets to the show are included in the full symposium fee, or sold separately online or at the door for $10 to $20. “Rain and Zoe” shows at 8 pm Fridays and Saturdays, and 5 pm Sundays from April 20 to 29.